HELLO, I CHOSE (AND EDITED ) THIS STORY ABOUT MY DISTANT RELATIVES. IT’S A BIT SAD, BUT VERY INTERESTING……EDITOR DES. There are some touching links between the Teddy Bear, that quintessential symbol of childhood comfort and security, and the tragic loss of the passenger ship Titanic on the night of April 14 1912. Daisy Spedden of Orange County, New York State survived the sinking of the great liner with her husband Frederic and their only child Douglas, then six years old. In 1913 Mrs Spedden wrote the story of their escape as a Christmas gift for Douglas, told through the eyes of the child’s white teddy, named Polar. The bear had been purchased from the famous New York toy store, F.A.O. Schwarz. In the 1980’s the manuscript was discovered in an attic by a relative, Mr Leighton Coleman. It was illustrated with delightful watercolours and family photographs. Moved and charmed by the story Coleman sent it to Little, Brown & Co,, who published it in 1994 under the title Polar the Titanic Bear. The wealthy Speddens travelled a great deal and were returning home aboard the Titanic after holidaying in Algiers and Monte Carlo. As Polar, explained in the story, the ship struck an iceberg at night; ‘It was our fifth night at sea. I had been in bed a few hours when I suddenly opened my eyes. The lights had been turned on. Muddie Boons [the Nanny] was dressing Master in a great hurry. “Come, we’re taking a trip to see the stars”, she said.’ The family made their way to the lifeboats and were among those rescued by the Carpathia. Daisy and Frederic were subsequently praised for their acts of kindness towards other survivors. Douglas Spedden was one of 112 children aboard the Titanic . Of the 56 who died, just one was from first class and fifty five from steerage. At the end of the book Polar comments wistfully, ‘Master Douglas goes to school now, and I am left alone much of the time. But I always look forward to the warm greeting he gives me on his return. Though I realize I will see less and less of him as the years go by, I shall always feel, no matter what happens, that I occupy a large corner of his true and tender heart.’ He wished Douglas a long and happy life, but in a tragic irony the boy died just two years later, aged nine. He was chasing a football across a street in Winter Harbour, Maine, when he was struck by a delivery truck. Another ‘Titanic Teddy’ was a six inch high, gold plush bear with a tinplate body made by the German toy company Bing, in 1907. It was allegedly found in the coat pocket of the ship’s catering manager, Gaspere Montalgo Gatti, known as Luigi, who was among the 1503 passengers and crew who perished in the disaster. Gatti was born in Italy in 1875 but moved to England as a young man. His wife Edith was a British subject and the couple had set up home at Southhampton, from where the ‘unsinkable’ Titanic set sail on April 10 1912. 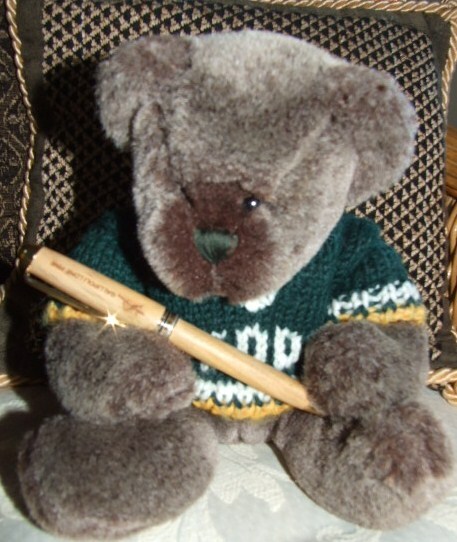 The little bear was said to have been a parting gift from Luigi’s young son Vittorio. Some doubt arose over the provenance of the bear as it was not listed among Gatti’s personal effects. However it is generally accepted that such lists were not exhaustive. During the blitz in World War II, the Gatti home was bombed and extensively damaged, but the family (and the little bear) escaped unscathed. Mrs Gatti later moved north and after her death in 1962 the bear was inherited by Vittorio, who in turn died in 1974. His widow Margery eventually presented the bear to the Ribchester Museum of Childhood, in East Lancashire’s beautiful Ribble Valley. Its fame grew when, in 1992, the English soft toy company Merrythought produced a limited edition reproduction to commemorate the 80th anniversary of the Titanic’s sinking. The Ribchester Museum closed in 1995 and its entire contents were sold at an on-site auction which by sheer coincidence I happened to attend My partner and I had visited the museum in its dying days and picked up a catalogue. In a complete flight of fancy we bid on a solid silver flea circus, complete with miniature flying trapeze and all manner of flea propelled apparatus. Sadly, the circus went to a pest control company for a sum well above our budget. Several lots later we watched the much anticipated sale of the Gatti bear. Amid strong competition an undisclosed private buyer made a winning bid of an astonishing £9,000, paid for rather oddly in five pound notes. Rumour had it that the bear would be travelling to Japan. It is possible that the purchaser was Yoshi Sekigushi, founder of the Izu Teddy Bear Museum in Ito City. The purchase price of the Gatti bear paled into insignificance when yet another ‘Titanic Teddy’ came onto the market a few years later. By now, the movie Titanic (1997) had created a world wide surge of interest in the loss of the liner. 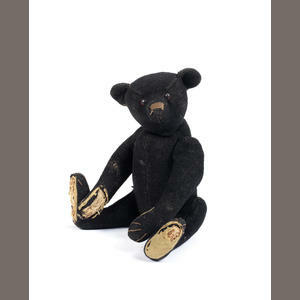 In 1912, 600 black mohair ‘Mourning Teddies’ about 50 centimetres high had been produced by the most famous of all bear makers, Steiff, as a gesture of empathy for those who had lost their lives. In December 2000 the London auction house Christies sold one of the bears for £91,000. It was in mint condition, having been locked away in a wardrobe for almost ninety years by its elderly owner. The woman had received it as a child but took an immediate dislike to the teddy’s sombre colour and red-rimmed, ‘crying’ eyes. You can leave a message if you like, in the box below. Don’t forget to scroll down and complete the anti-spam sum before pressing SUBMIT. I was very moved by reading this article and I am glad Desmond chose it as his story choice. imagined the bears in this story to be real as well. I can understand why people collect bears as they do remind you one of how safe and content you felt as a child whilst hugging your Teddy. I thought my choice was quite good, though I say so myself. May write a story of my own next, if I can get a certain person away from the computer. She could be making cakes or dusting! Pauline, what a lovely site. I’m jealous now! I was particularly taken by this piece on the Titanic Teds, as you probably remember me saying my 84 year old Mum makes Teds of all shapes and sizes, usually in real mohair or alpaca, and all entirely sewn by hand. I’ve been known to make a few myself, my smallest is about three inches high the larget about two feet high. Your story of the little Gatti bear, really touched me, it was actually one I hadn’t heard before, thank you. Does it have a name do you know? As a little aside, I live about 5 miles from Ribchester and have been to the Museum you mention. Shame it had to be sold it was unique!. Good Luck with the site H.E. Asked (then told!) Editor Des to do some more digging but he can’t find a name for the Gatti bear. Yes, the toy museum was a real loss but never mind; you live in a beautiful area & still have the interesting Roman ruins. I am finding all of your writing exciting,and knowlegeable,I look forward to being entertained for years to come. Keep up the good work,and stay well,so that you can continue with your passion. So pleased you are enjoyng the articles Ruth. I suspect the writing is helping to keep me well! Thanks Diane and sorry for the delay in response; my spam catcher was a little over-enthusiastic! Yes, I think a lot of us would like to adopt little Polar. Associate editor Desmond who chose the story would like him as a brother! Loved the querky story and more so the poem. oops wrong story never mind love all the stories they do inspire me somehow. Thank you Donna. I think you mean my gnome poem on the blog about Putney. I made it up out of my head. I found this very touching – and despite my own research into the ‘Titanic’ for my novel, THE MASTER’S TALE, I didn’t know about the teddies. If possible, I would like to make a link from this to my site – or from my site to this, if I can get the terms right! Thanks for the lovely feedback Ann. By all means go ahead with the link! Will be interested to read The Master’s Tale. What an interesting story. I had never heard of the Titanic teddies before. Thanks Melisa, glad you enjoyed it. Loved this story as I do all of them. I had not heard of the Titanic teddies either. There is something so huggable and comforting about a teddy bear.